FRESH AND FRESHER Clockwise, from top left: tuna, egg, green beans (No. 56); carrots, blueberries, sunflower seeds (7); croutons, tomatoes, mozzarella (42); walnuts, blue cheese, raspberries (49); couscous, oranges, honey (95); strawberries, tomatoes, Parmesan (13). Okay, let's face it folks, for most of us the weather is hot, hot, hot! Who feels like cooking day after day, heating up the kitchen and running up those electric bills as the AC tries to compete with the stove/oven? Plus, summer just makes me want to eat lighter on most days. This may also have something to do with the whole bathing suit thing. Salads are always a good way to go, but sometimes my brain needs ideas for new combinations, so I don't suffer from salad burn out. I was thrilled when I received an email on Wednesday morning that contained a link to a recently published article in the New York Times by Mark Bittman, 101 Simple Salads for the Season. 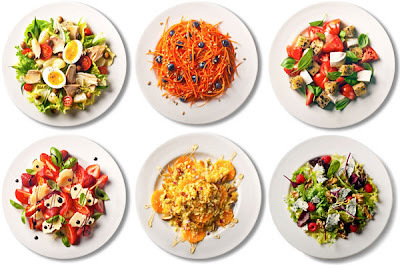 Yes folks, there are one-hundred and one salad combos listed in Mark's brilliant column! Some do require a minimum of cooking, but even some of these are ingredients you may already have on hand as leftovers from earlier in the week. The salads are broken down by categories: Vegan, Vegetarian, Seafood, Meat, Noodles, and Grains. Each consists of just a few sentences of ingredients and directions, so it couldn't be easier. I used the print feature and made a copy to keep on hand. They all looked delicious to me, but the one I'm going to try first is #101: Cook a pot of short-grain rice. While it’s still hot, toss with raw grated zucchini, fermented black beans, sriracha, sesame oil, sake and a touch of rice vinegar. Add bits of leftover roast chicken or pork if you have it, and pass soy sauce at the table. Now I just have to find out what sriracha is and I'll be all set. 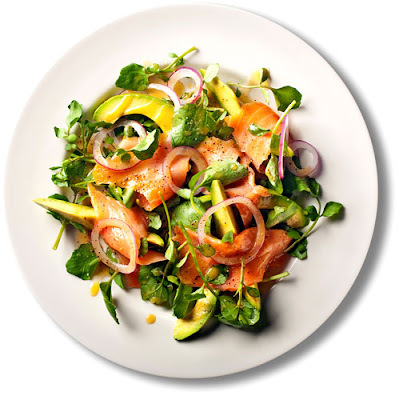 Find the rest of Mark's inspiring salads here, print out your own copy and then go over to Michael's at Designs By Gollum for even more links to inspiring Foodie Friday posts! 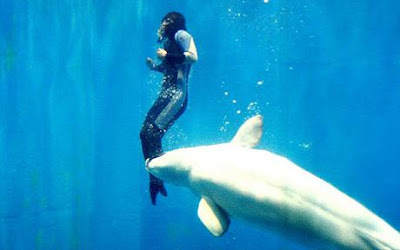 Tourists at an aquarium in China witnessed a dramatic event when a beluga whale named Mila rescued a drowning diver by pushing her out of the water. Seems Mila recognized and responded to the situation before those watching were even aware there was a problems. Animal instincts will never cease to amaze me! We seen dolphins rescuing swimmers and we've all heard or read the stories of dogs detecting a medical problem in their owners or waking their owners when a fire breaks out. I remember when my dog Sheldon was just a pup. I was in the front yard gardening and had Sheldon on a 16-foot leash, so he couldn't run out in the street. Just as my mom was coming into the yard, a woman was walking by with her guide dog. Sheldon ran (this is why he was on a leash) towards the street and mom tripped over the leash, breaking her knee. That guide dog came right over, laid down next to mom and put his head on mom's leg. That dog knew something was wrong. Sheldon at just a few months old, of course, figured this dog was there to play with him. He's 11-years-old now and his instincts are much better. He is the first one there when I'm having a good cry, climbs into my bed to lay when I'm sick, but he still doesn't know not to run into the street. Oh well, he's a good dog and I couldn't imagine life without him. Read the full story about Mila at the Telegraph UK. 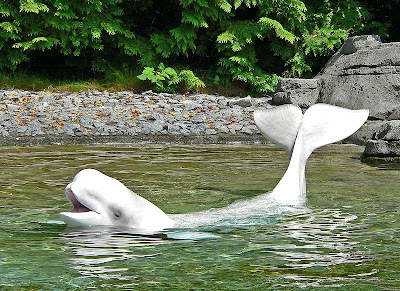 Did you know that a beluga whale's mouth is permanently upturned like a smile? Visit Save the Whales to learn more about whales and how you can help protect them. I'll also be posting more about this next year as the date moves closer, but for teachers both at school and at home, this is a good time to start fitting this into your lesson plans. Everything you need to get started is available for download on the website. That's if for today folks. Let's all be like Mila and if you see someone drowning, whether on land or in the sea, lend a supportive hand in any way you can. A few weeks ago on Outdoor Wednesday, I took you for a walk at the Indian Rocks Beach Nature Preserve and told you about the three varieties of Mangrove Trees that grow there. Just outside the fence that protects this area is another interesting tree, or I should say trees as you will see. Attached to the preserve is a lovely park with picnic tables, a dog park, and a playground for the children. BUT, something lurks there that is sinister — a strangler! 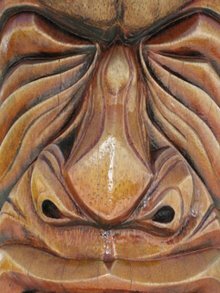 What do you think of this tree trunk? Unusual, yet interesting, don't you agree? 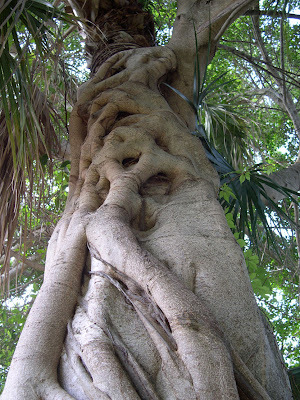 This is a Ficus aurea, known as the Florida Strangler Fig. 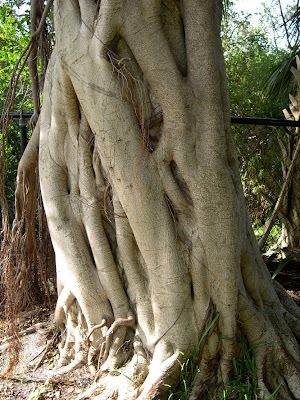 A native of Florida, this tree grows in a most unusual way. Let me back up and show you something you may never have seen. Look in the top, right area of this photo. See anything? As usual, you can click on any photos to enlarge them. Okay, let me zoom in a little to give you a better look. See it now? Are those palm fronds up there growing out of this tree? Now let me back up and give you an overview of this tree/trees. Isn't that crazy? A palm tree growing right out of the middle of the Strangler! I walked around to another side to give you another look. 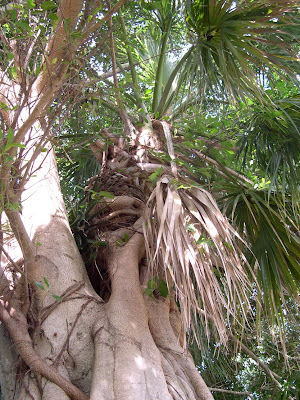 See how this Sabal Palm (aka Cabbage Palm) is completely encased in the Strangler? How did this happen? Well, the figs produced by the tree are ingested by birds, who then "disperse" them. (NOTE: Studies show that seeds that pass through the digestive system of the birds are more likely to geminate.) This germination usually takes place in the canopy of a host tree, which is this case was our unsuspecting, unfortunate palm. The Strangler then grows as an epiphyte, or air plant as they are commonly called. 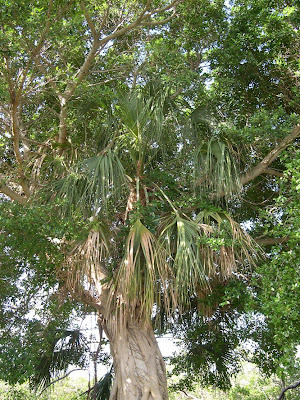 The epiphyte derives moisture and nutrients from the air and rain, so it thrives in our humid climate in Florida. 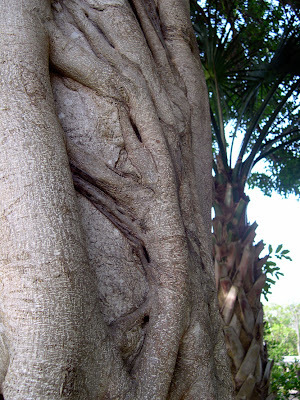 Over time prop roots grow down the trunk of the host tree, eventually enveloping it and becoming a tree itself. Essentially, it strangles the host tree, which will eventually die. The palm tree here is holding its own for now and made for an interesting photo shoot. 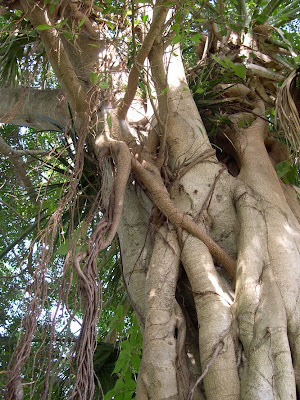 So, is the Florida Strangler Fig really a terrible tree? No, in the Circle of Life, the Strangler, with all its little nooks and crannies, provides a natural shelter for birds, small mammals such as squirrels, and reptiles. The figs it produces feeds our wildlife, including Pegoscapus mexicanus, a small wasp that goes largely unnoticed, but can only survive because of the Strangler. Here is one last shot of the Strangler. See the Sabal Palm nearby? Do you think he's a little nervous after witnessing what happened to his friend? That's it for today. For those of you who were here last Wednesday, you saw I had planted my Plumeria seeds. Well, they sprouted and I posted pics yesterday, it was all very exciting. Now, quick, get out of here before the Strangler sees you! 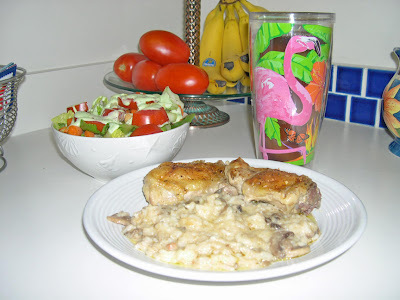 Go over to Susan's @ A Southern Daydreamer, where it's nice and safe and you'll find links for others who have Outdoor Wednesday postings. For those of you who were here last Tuesday, you know I started my mini-farm of Plumerias and planned to document its progress each week. 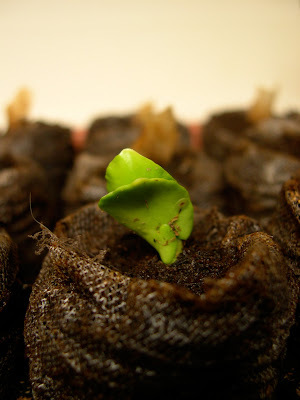 I also wrote that if the seeds didn't sprout I would have to find a new project to record. 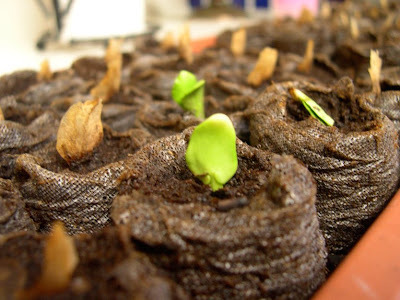 Well, the good news is……drum roll, please…… we have sprouts! I planted my seeds on a Sunday and this past Sunday, as I was bringing the farm in for the night (what other farmer can do this? 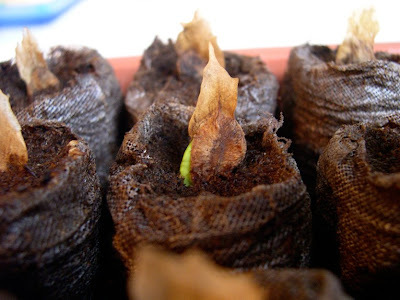 ), I saw a speck of green and there it was — my very first seedling! Well, here it is Tuesday and last night there were two more, so now there are three little seedlings. While watering this morning, I noticed the forth poking its little head out, so the farm is officially up and running! Or up and growing I guess is the proper terminology. Last week I also stated that I would post this week on how to make a Hawaiian lei with plumeria blossoms, but I ran into two problems. First, I can't find my lei needle and second when I walked out this morning the rain was just stopping and my flowers were soaking wet and droopy, so making a lei will be in the future. 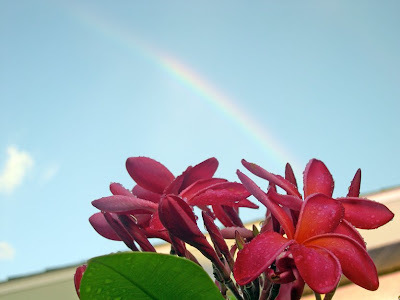 A rainbow in the distance peeking over my plumeria tree! I'm taking this as a good sign for the farm. What do you think? FACT: From the Field Guide to Plumeria on Trails.com I learned, "Plumeria flowers are a royal tease. They do not produce nectar, but their hypnotizing scent tells insects otherwise. Their main pollinator, sphinx moths, will pollinate the flowers as they go from one to the other looking for the sweet nectar they think they smell. Because these flowers try to attract these specific moths, they produce a stronger scent at night, when the moths are more active. In Brazil these flowers are called Lady of the Night for this reason. Have a wonderful week and may all of life's seeds blossom for you and may you find rainbows just outside your door! 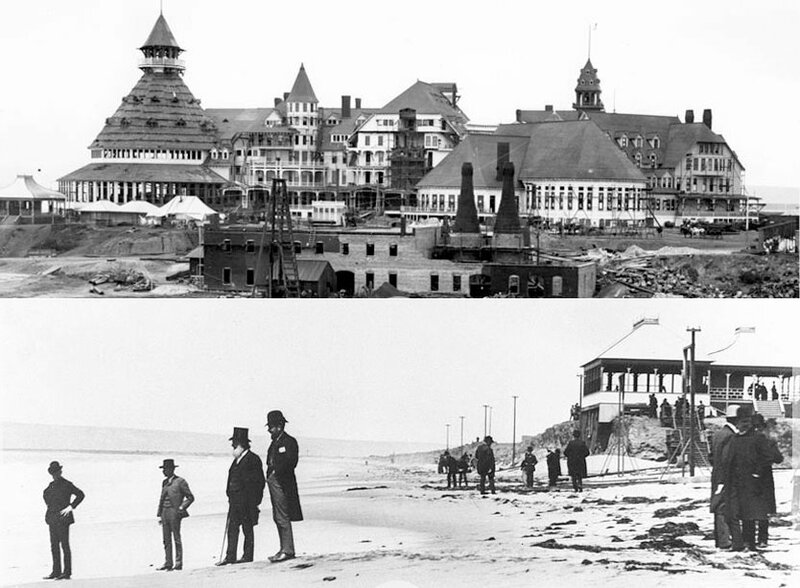 After paying $110,000 for all of Coronado and North Island, Elisha S. Babcock began construction of his dream hotel "on a sandspit populated by jack rabbits and coyotes" in March, 1887. The hotel opened in February 1888, but because of financial difficulties, Babcock was forced to sell out to sugar magnate John D. Spreckels in 1890. 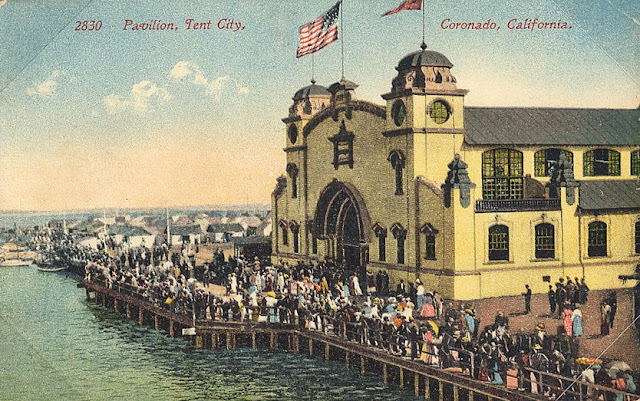 For more on the history of The Del read the article on wikipedia. 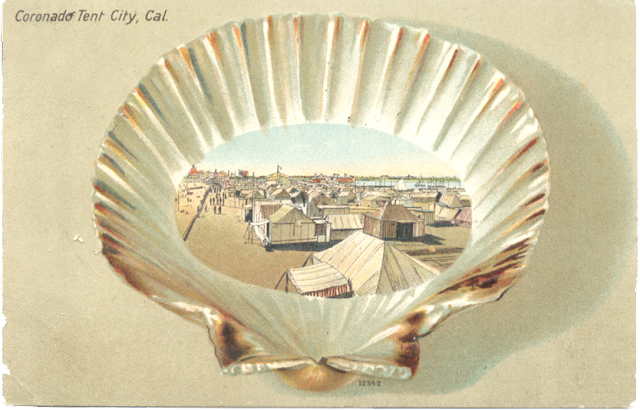 The San Diego History website provided a wealth of information on Tent City, but surprisingly few pictures. The photos today come from numerous sources, all of which are available on multiple websites. Remember, you can click on any images to enlarge them. 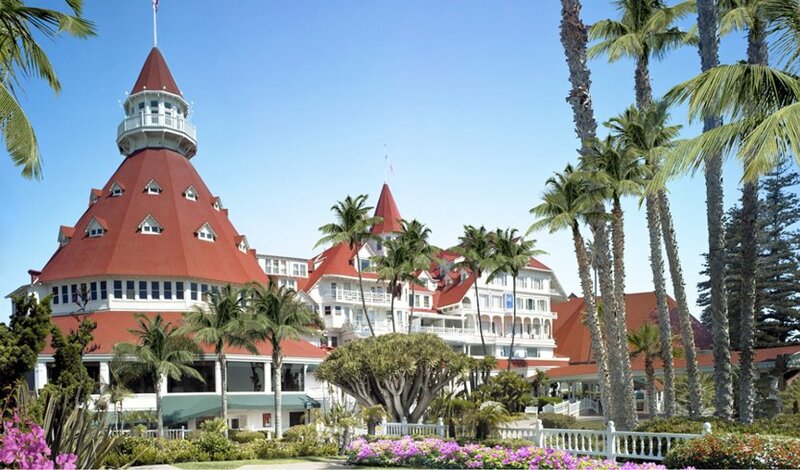 Spreckels owned the hotel until 1948 and spent his life developing enterprises in San Diego County that eventually led to the area becoming what it is today. 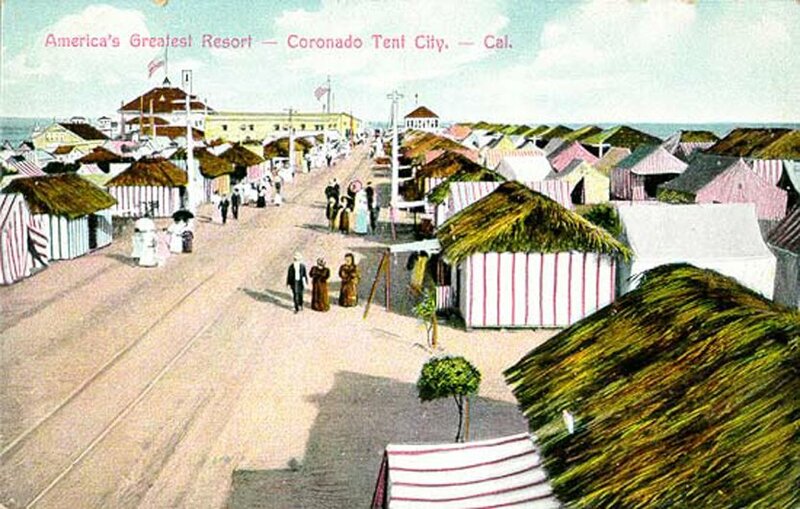 One of his early ventures was the construction of Tent City, located just south of the hotel, it quickly became an immensely popular vacation spot for those who could not afford to stay at the hotel. 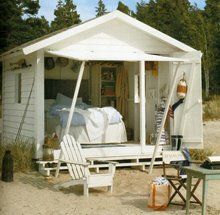 "Each tent consisted of wooden floors and furnishings. They each had one bedstand or more, a three legged "spider" for a wash bowl and pitcher, a dresser and a chair. If a visitor needed cooking facilities a kerosene stove was set up in a "cook tent" in the back of the tent for an extra $5.00 a month, it came with a few pots, some crockery, and flatware. Most of the tents rented for $4.50 per week at that time." "Every year Tent City opened with new attractions and improvements. 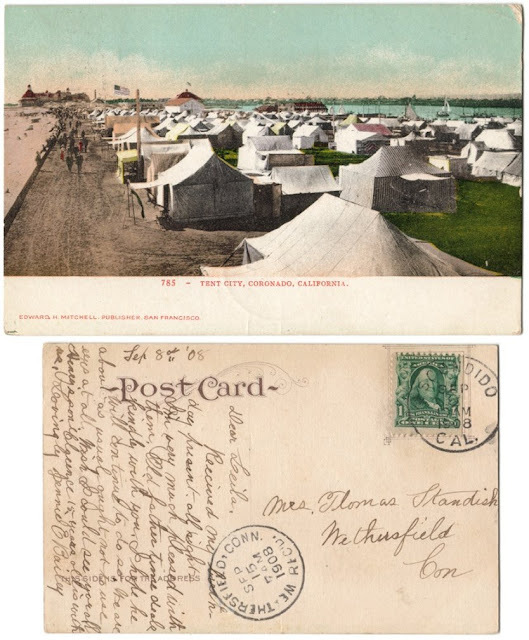 Eventually electricity from the hotel generators provided power for the lights that hung from the ceiling in each tent." 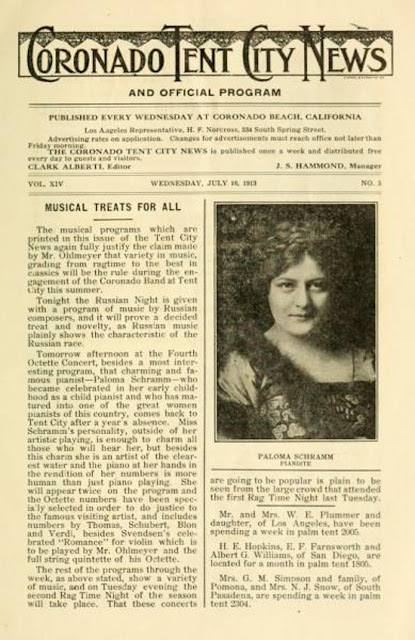 The Coronado Tent City News served as a type of newspaper carrying programs about the band concerts, water sports events, hours of Sunday church services, news of visitors, and some advertisements. Click to enlarge this great image! "By 1921, Tent City had its own police force (watch the video to learn more about the one-man police force) and fire department. 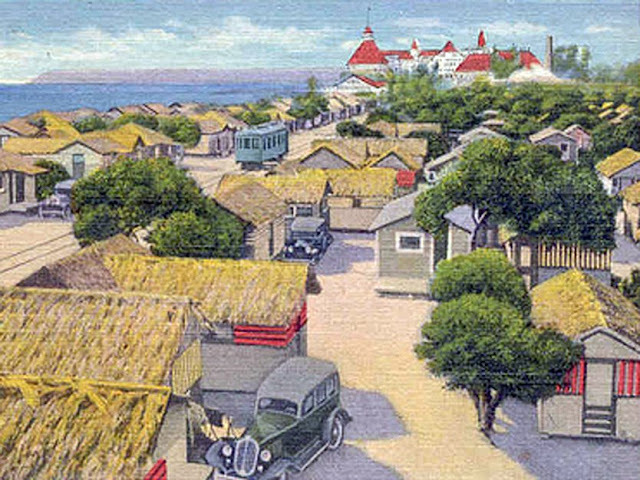 In 1923, the thatch roofs were stripped off and the cottages were given permanent roofs. Wooden sides on the houses were built three quarters of the way up with canvas drops that could be rolled up or down. These improvements made it possible for a permanent winter population in Tent City." 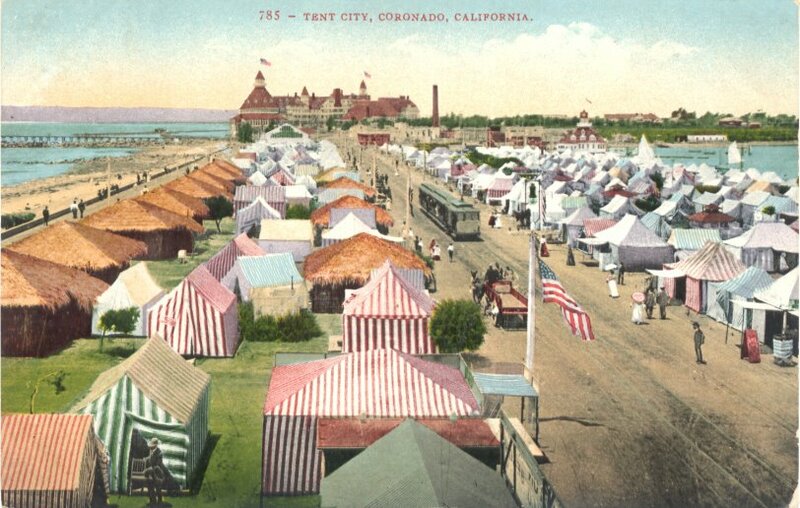 From 1923-1933 Tent City had become a year round resort. 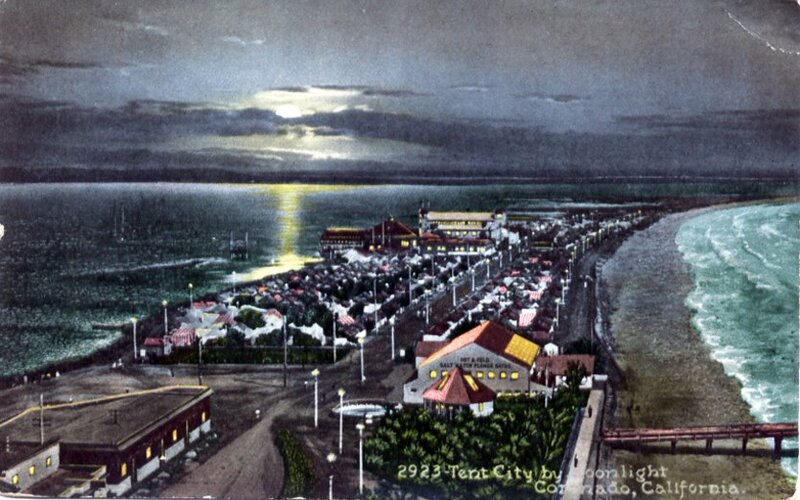 To everyone's surprise, in June 1936, the Spreckels Company announced the abandonment of the Tent City as a resort and in its place the State Highway would be straightened. Tent City was dismantled in 1939 and in its place now is a parking lot. The little fellows will ever be honored guests at Coronado Tent City. They are our best friends because they never forget the good times that have at the beach. Seldom do they go far from tents without grownups accompanying them to their pleasure on the sand, the playground, the concerts, or the alluring Merry-Go-Round. 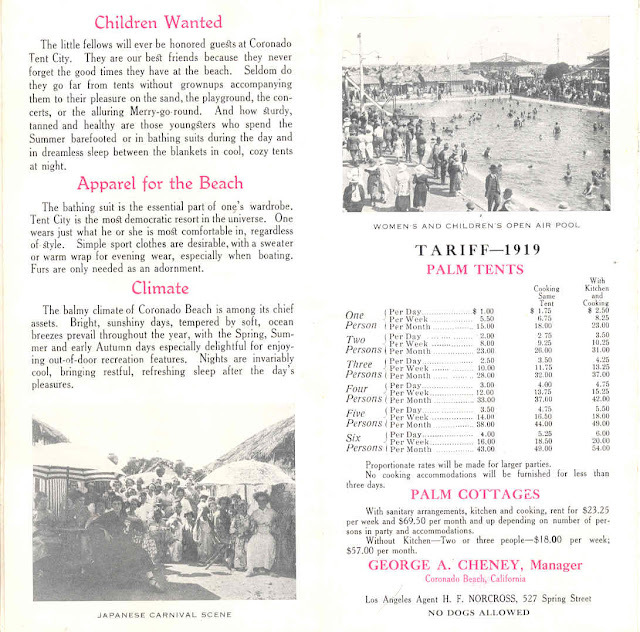 And how study, tanned and healthy are those youngsters, who spend the Summer barefooted orin bathing suits during the day and in dreamless sleep between the blankets in cool, cozy tents at night. 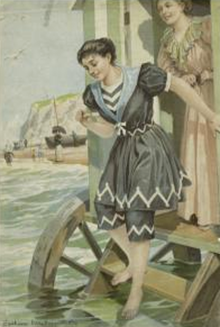 The bathing suit is the essential part of one's wardrobe. Tent City is the most democratic resort in the universe. 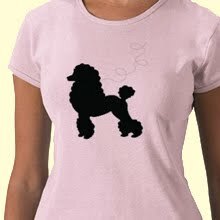 One wears just what he or she is most comfortable in, regardless of style. Simple sport clothes are desirable, with a sweater or warm wrap for evening wear, especially when boating. Furs are only needed as an adornment. 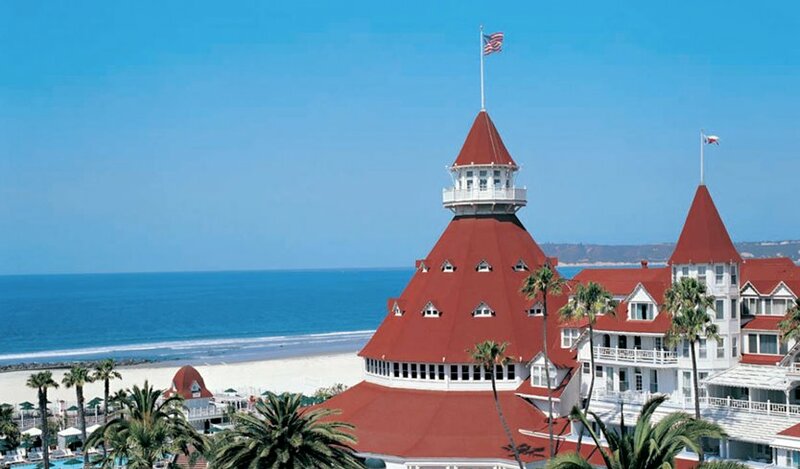 The balmy climate of Coronado Beach is among its chief assets. Bright, sunshiny days, tempered by soft, ocean breezes prevail throughout the year, with the Spring, Summer and early Autumn days especially delightful for enjoying out-of-door recreation features. Nights are invariably cool, bringing restful, refreshing sleep after the day's pleasures. With sanitary arrangements, kitchen and cooking rent for $23.25 per week and $69.50 per month and up depending on number of persons in party and accommodations. Without Kitchen—two or three people—$18.00 per week; $57.00 per month. "Twenty thousand people lined the shores to witness the arrival. 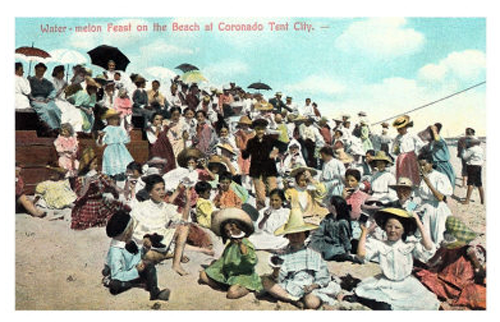 Never before had San Diego been the scene of such a gathering of cheer and enthusiasm. 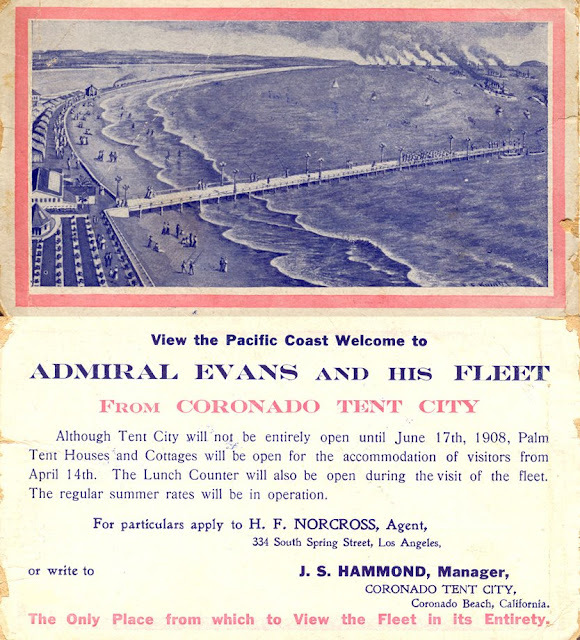 Early in the morning crowds had started heading for Coronado, the street cars and ferries were jammed. 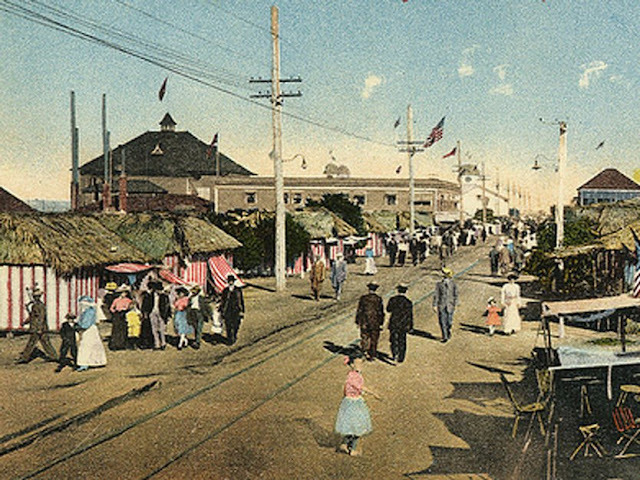 Thousands ignored the street cars and choose to walk. The fleet approached in a squadron formation. When they had gotten to within clear sight of the spectators, the lead ship Connecticut could be seen turning slightly before dropping her anchor. The other ships followed in turn." Postmarked San Diego, Cal. Apr 22, 1908 and addressed to a Mr. Jas. Smothers, West Frankfort, Illinois. "Received your letter. Been having a great time here during the fleet celebration. Did you read about it there? M.P." 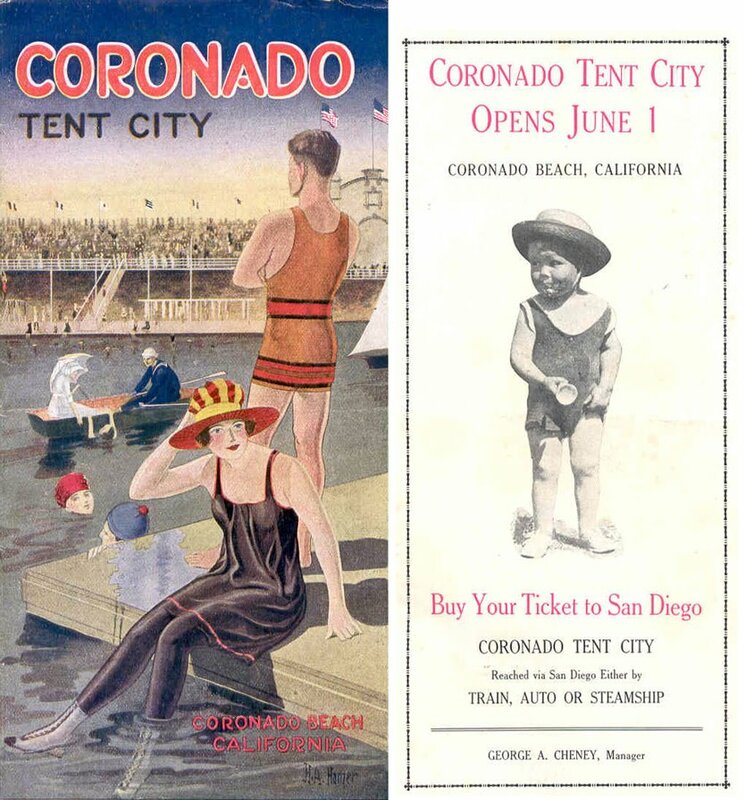 About San Diego, a news story documenting the historic 1910-1930s Tent City south of the famed Hotel del Coronado in Coronado, California. Tent City was created for families on a budget who couldn't afford the luxurious hotel. 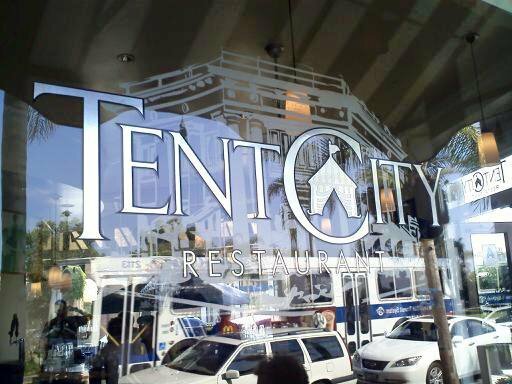 Today you can still find Tent City in Coronado, but now it is only a restaurant. I wonder if they cook the food in tents? Before I go, I want to tell you about a blog I ran across while searching for information on Tent City. 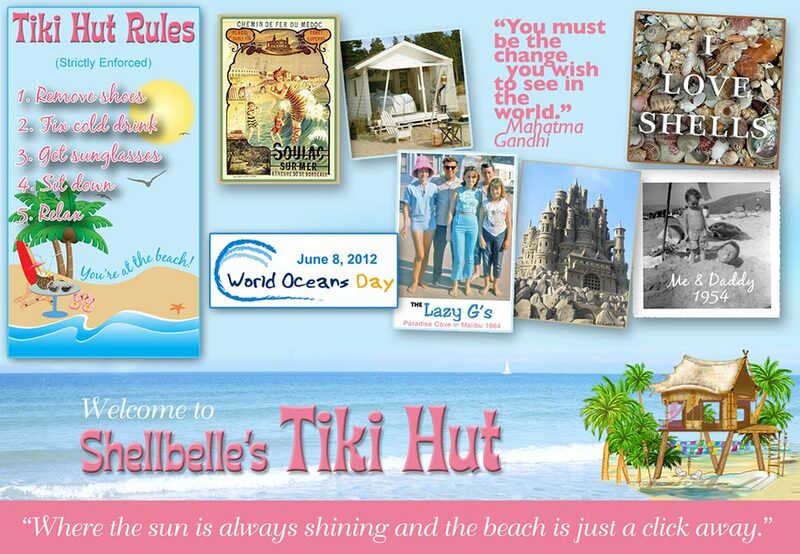 She blogs about the beach from California, along with vintage photos and travel posters, gardening, surfing, squirrels, seagulls, and more. Look like we have a lot in common. Check out her blog at Daughter of the Golden West and read her second post on Tent City here. UPDATE: As soon as I finally got my post up today, I stopped in at Completely Coastal to see what Maya had posted today and I was so excited to see Beach Parasols from France. 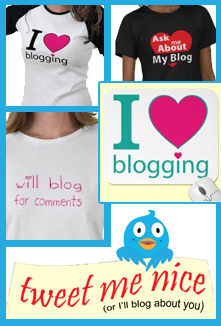 You have to check these out, I just fell in love with them! I hope you enjoyed this vacation into the past and will come back next week to see what I'll be posting then. Another Update: I was so honored to find out that this post was featured on A Festival of Postcards on August 23rd. 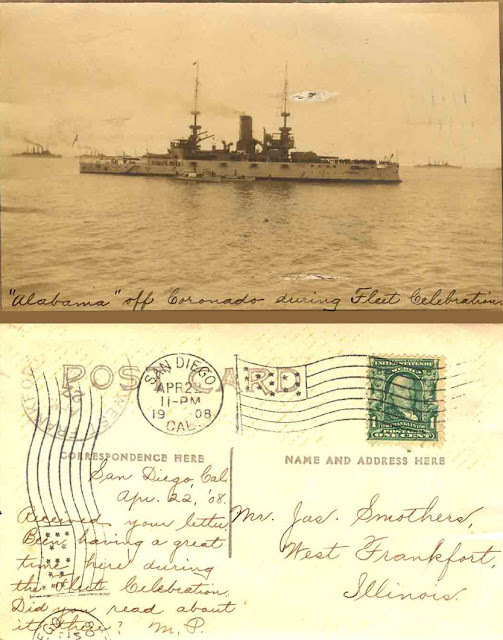 Evelyn's delightful blog share's two things with her readers, her love of vintage postcards and her love of genealogy. Since both of these are passions of mine, I couldn't be more pleased. Thanks Evelyn! 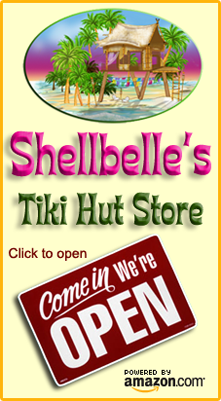 Here we are at week #11 in my seashell game! After next week I will be announcing the winner! Sorry about missing last week, but life happens and something else had to take priority. This competition has a giveaway to the person who gets the most right answers first in twelve weeks. The winner gets to choose the mousepad of their choice from my Zazzle store. 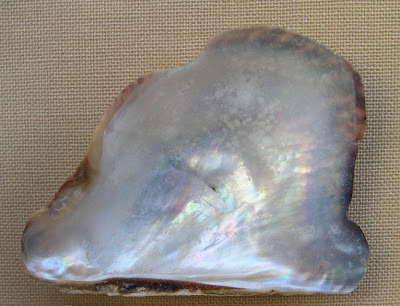 With that said, here is this week's seashell, do you know what it is? When I need comfort food I easily return to my Southern roots. Though I was brought up in California, I was born in Atlanta, Georgia to parents who were both also born in Georgia. Those of you who have read my blog before know that my family history in America goes back to Virginia in 1607. My parents were the first ones in my line to move away from the South, but ours was still a Southern household. I grew up on the likes of fried chicken, chicken-fried steak, grits and eggs, collard greens, biscuits and gravy, black-eyed peas, cornbread, peach cobbler and sweet tea. 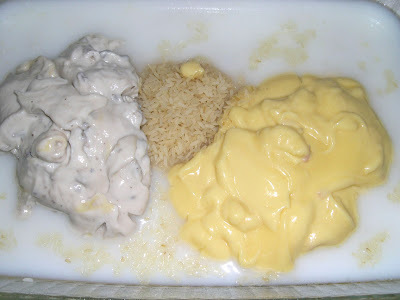 A few weeks ago we had a bit of reprieve from the summer heat and I decided to make a very traditional meal that all you Southerners out there will recognize and one that I hope others will try. You'd be hard pressed to find a Southern cook that doesn't have the ingredients for this dish always on hand in their pantry. 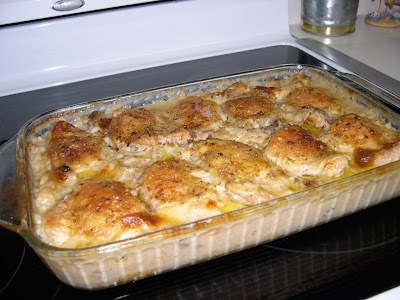 No fuss, easy and a sure-fire crowd pleaser, Chicken and Rice Casserole is a must have recipe for any true Southerner. I serve it with a simple green salad and a big glass of sweet tea. Mix all ingredients except the onion soup together. Pour into a 9” x 13” baking pan. 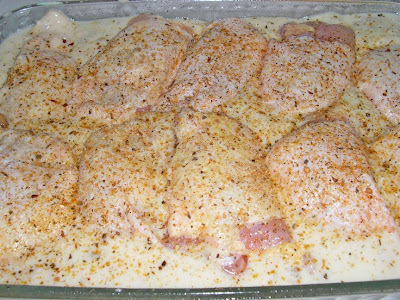 Place chicken pieces on top. Sprinkle instant onion soup, cover with foil and bake at 350° for 1 and a 1/2 hours. Remove foil during the last twenty minutes to allow chicken to brown. Notes: This is the traditional recipe. 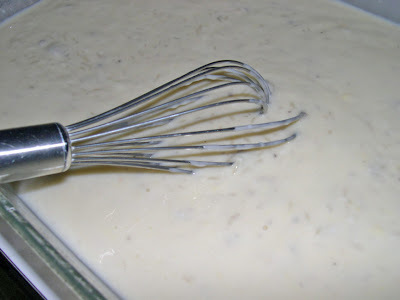 You can use any kind of "cream of" soups you'd like. 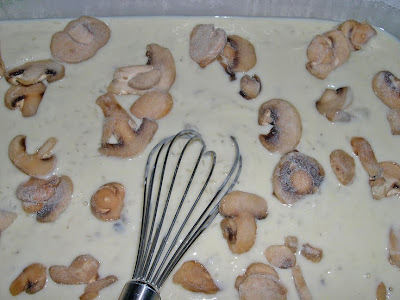 I like mine with cream of chicken and cream of mushroom and I add more mushrooms on top of the rice mixture. 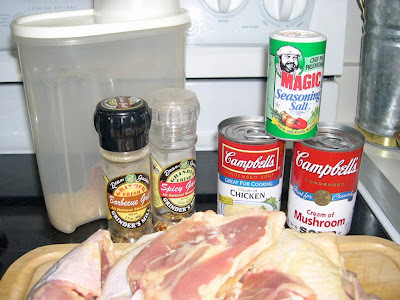 The ones I used here are frozen from Publix, but you could use fresh, just don't use canned (ick!). I stopped using the instant onion soup many years ago (sorry mom), and instead use fresh ground seasonings. I have also used French's French Fried Onions on top and they add a nice crunch. Growing up we always used a cut up fryer, but you can use all breasts, thighs, legs, or any combo according to your family's preference. You can also use boneless, skinless chicken breasts, but hey, this is comfort food and all that fat makes the rice very comforting. When the dish is done the rice should be a bit on the soupy side. Now git on over to Michael's and ya'll come back now, ya hear? Exotic plumeria flowers with their velvety texture and sweet fragrance are absolutely my favorite flower. About seventeen years ago I purchased a plumeria cutting at the Strawberry Festival in Plant City, Florida. I brought it home, laid it on my kitchen counter and promptly ignored it for months. Then one day it caught my eye and on closer inspection I noticed little leaves sprouting from the top! This is one hardy little plant I thought to myself. I read the piece of paper that had accompanied my purchase and followed the directions, which basically were to stick it in a pot of soil and water. My plumeria lived in that pot for a few years before I finally planted it in the yard. The plant was always pretty, but flowers were not to be found. At this time I was bouncing back and forth between California and Florida and in 1999 when we sold the beach house and moved inland, I dug up that little tree (with permission from the new owner) and moved it with me. When I moved here permanently in 2000, I planted my oft neglected plumeria in the ground once again and it has rewarded me ever since. My little tree now stands proudly at about 11-feet tall and every year blooms profusely. 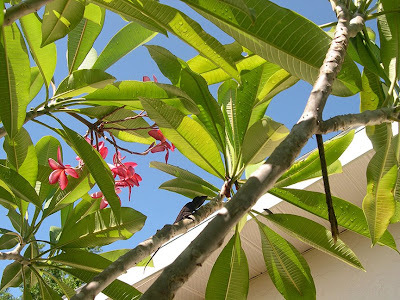 Not only do I enjoy my beautiful plumeria tree, so do some of the local wildlife. We have hundreds of little lizards that live in our yard and they are very territorial. This is the lizard who has made the tree his home. I was excited when I opened the photo on my computer and saw his lady friend poking her head up from one of the leaves. I took this photo yesteday. A couple of months ago I was out shooting in the yard and captured this ladybug feasting on a few aphids. 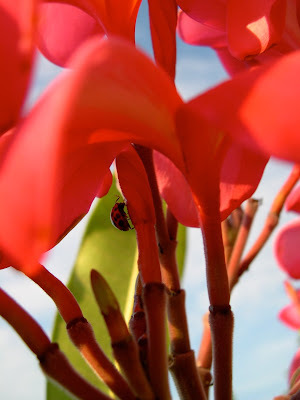 The ladybugs help keep the aphid population in check. When the weather cools the leaves of plumerias fall off and the plant goes dormant. This is what my tree looked like on March 25th of this year. The leaves are just starting to grow back and you can see two seed pods on the right. Two years ago it developed a seed pod, which I pulled off the tree too early, spoiling the seeds. 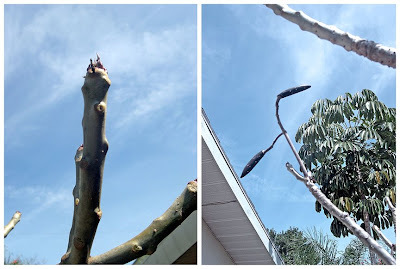 Last year four pods formed and I started researching how to properly grow plumerias from seed. The pods must mature on the plant for 8–9 months, so I patiently waited and kept a close eye. Last week I was again rewarded by my little tree when the pods had sufficiently dried and were starting to open. This begins my new project—plumeria farming! 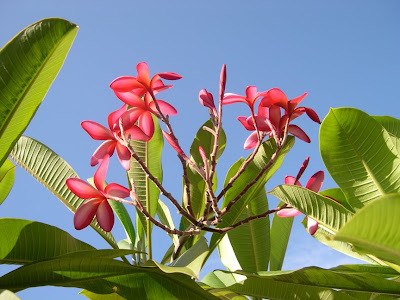 I believe that most folks who raise plumerias call themselves growers, since members of my family have been farmers (or planters) in America since 1607, I've decided to go with plumeria farmer. 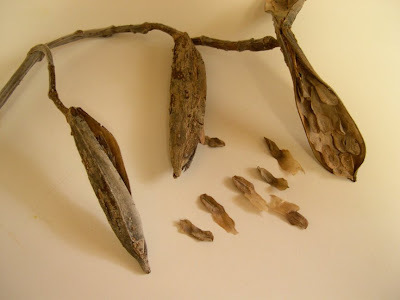 First things first, I harvested my seed pods and gently extracted the precious seeds. 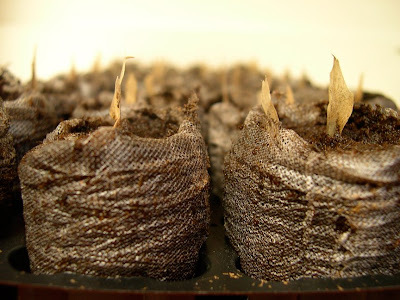 Next I readied my peat pots by soaking them in water until they expanded to about an inch and a half tall. 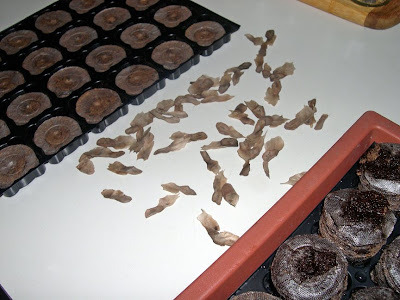 I carefully planted the seeds, leaving the papery wing above the soil line and gently pinching the soil against the seed. 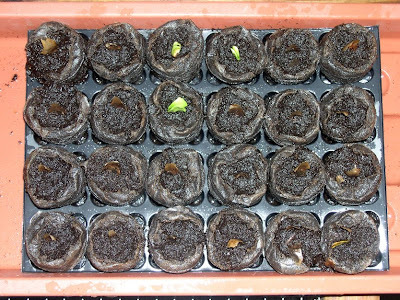 I'm keeping them very moist for the first two days, so that the seeds will plump and then I'll keep them just moist enough to sprout, but not so wet as to cause rot. From what I've read, I can expect my seeds to spout in 3–14 days. Keep your fingers crossed with me. I'm planning to document the progress of my plumeria farm each Tuesday, so if they don't sprout I guess I have to find a new project. I'm keeping The Farm outside in the sun, but bringing it in at night. This will accomplish two things — I won't forget to check the soil moisture each morning and evening and if one of our tropical storms comes through while I'm sleeping, the little farm will not be washed away. Over all, it will take three to five years before my seedlings (hopefully) will start branching and blooming. After about three years they'll be 3-5 feet tall, so this is a long-term project. 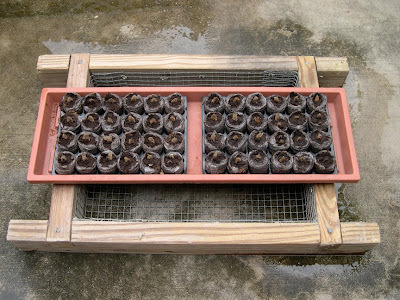 I planted about fifty seeds and will very happy if a dozen or so grow. Time will tell if I am as successful as my ancestors. Just to show you how much passion I have for plumerias I thought I would share a photo with you. 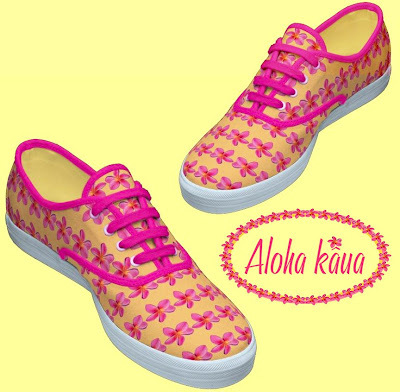 When I first started designing custom Keds, the very first pair came from a photo of a plumeria blossom I isolated in Photoshop and then repeated in a pattern. I used a yellow background to signify the sun. They are still my favorite pair and the second most popular in my store, the most popular are the flamingos. That's okay, flamingos are my favorite bird! The emblem here goes on the matching t-shirt — surrounded by beautiful plumeria flowers this traditional Hawaiian greeting translates as, "May there be friendship or love between us!" Pronounced: ah loh' hah KAH'oo (w)ah. Since I don't expect much to happen over the next seven days, next Tuesday I'm going to do a post on how to make a Hawaiian lei with plumeria blossoms. Hope to see you then! Update: Since this is the first posting of The Farm, I'm also going to use it for my Outdoor Wednesday post this week. 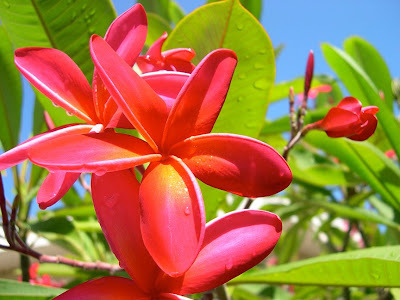 If there is anyone out there in blogland who has experience growing plumerias from seed, please feel free to offer your advice. I'll be back next Wednesday with my normal OW post, I have pictures of a most unusual tree to share with you (I can feel the suspense mounting). Be sure to visit our hostess with the mostess, Susan at A Southern Daydreamer for more Outdoor Wednesday posts!